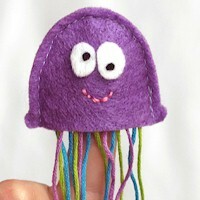 These Ocean Creatures Finger Puppets are very simple for kids to make when pairing shape templates and felt! 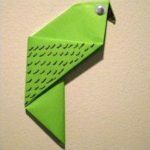 This craft is full of personality with expressive eyes and texture. 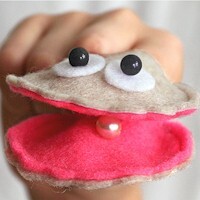 The clam, complete with pearl, even “talks” by making use of your index finger on top and thumb below. The storage pouch even doubles as a background by holding up behind puppets with your opposite hand! Trace 3" star from star shape template onto butcher paper and cut out. Pin pattern to yellow felt and cut out twice. Cut two small ovals from white felt and adhere to front of star with a french knot of black embroidery floss. Add three french knots with yellow embroidery floss to each point of star. 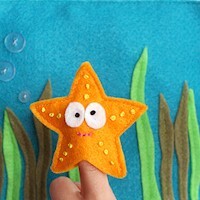 Hand stitch smile onto star with pink embroidery floss. Machine (or hand) stitch around star leaving bottom open. Trace 2.5" circle from circle shape template onto butcher paper. Mark at each grid mark at top making 7 marks total. 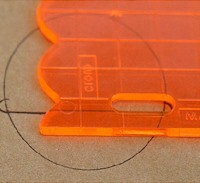 Use scalloped edge of circle shape template. Align a scallop between each set of markings and draw in scallop. Fold paper just above bottom of circle and cut out template. This gives you a doubled shell. 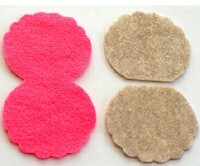 Pin and cut out template from pink and brown felts. Cut brown felt in half as shown. Sew on white ovals of felt on top shell with black beads and thread. Sew pearl onto bottom half of pink inner shell. 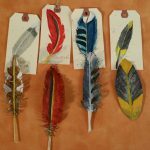 Sew brown out shells onto pink inner shell around circle edge, leaving the straight lines open for fingers. Trace 2" x 2.5" oval from oval shape template onto butcher paper and mark oval at 4th grid mark down on each side. Align grid marks with pill-shaped marking on side of template and trace as shown on each side, connecting bottom lines at center. Cut out template. Pin and cut out two pieces from purple felt. Add line of felt glue along interior bottom of one piece. 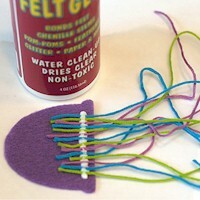 Add cuts of embroidery floss and go back with another line of felt glue on top. Allow to dry fully. Once dry, sew on two oval felt eyes using black french knots. Hand stitch a smile using pink embroidery floss. Stitch both sides together leaving bottom open. Trim blue felt to 11" x 7.5" using rotary cutter and acrylic ruler on cutting mat. Cut out strips of green felt by hand organically and stitch along short side of felt. Stitch on a few clear buttons (depending on age of child) for bubbles. Fold felt in half and stitch around perimeter leaving entire bottom open. Is there a printable template? If so, I can’t find it… Thanks. No the shape templates are sold by Fiskars http://www2.fiskars.com/content/search?SearchText=shape+templates&x=0&y=0 but you can create your own free hand templates for these puppets.